April 21st is National Junior Ranger Day, and we’re celebrating with our first-ever Junior Ranger Ramble! Great for the entire family, the Junior Ranger Ramble encourages kids to discover the Arabia Mountain National Heritage Area through guided and self-guided activities at many of our partner sites. The first 50 people to sign up will receive a Ramblers Discovery Kit that includes tools to help you explore the National Heritage Area. The Ramble runs from 10:00 AM until 4:00 PM with scheduled activities throughout the day. Families can check in and ramble at their leisure. The adventure starts at the Davidson-Arabia Mountain Nature Preserve where you can pick-up a passport with a schedule and self-guided activities. 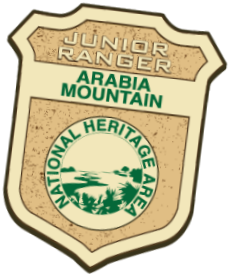 Ramblers who complete five activities will become official Arabia Mountain National Heritage Area Junior Rangers! The swearing in ceremony will take place at the Davidson-Arabia Mountain Nature Center at 4:00 PM. Accommodations will be made for those who cannot attend the ceremony.